The KHIF (Kyung Hee International Foundation, Inc.) was chartered as a Charitable Organization and incorporated in the State of New York USA in January 2001. The KHIF is exempt from Federal Income Tax under section 501 (a) of the Internal Revenue Code as an organization described in section 501 (c) (3). Several Kyung Hee University Alumni residing in the USA attended the 50th Anniversary of Kyung Hee University in Korea and discussed to establish Kyung Hee International Foundation for the benefit and prosperity of Kyung Hee University to commemorate its 50th Anniversary. 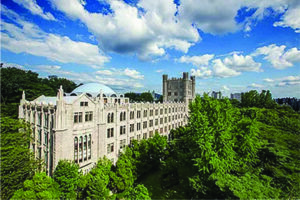 Dr. Chungwon Choue, the president of Kyung Hee University expressed his great interest in the idea and encouraged to include all Kyung Hee Alumni worldwide. Some of the Kyung Hee alumni residing in the USA started to participate in KHIF by becoming Charter Members, drafting the Charter and publicized for more participants and exchanged their thoughts with the International Relations Center of Kyung Hee University. KHIF hired attorney Allen M. Schwartz, ESQ. in New York, as counsel to legally assemble the Charter. About 30 alumuni signed in as Charter Members and started to review in detail the draft of the KHIF Charter. Dr. Ke Young Chu, Ph.D.
Dr. Hong Youl Park, Ph.D.
Dr. Yoon Shik Park, Ph.D.
Mr. In Yong Yi, ESQ. Dr. Mee Ree Yun, MD. 42 Charter Members of KHIF elected the following 7 Members of Board of Directors from November 16, 2000 to November 30, 2000 by vote with mail ballot. Kyung Hee International Foundation, Inc. was registered in the State of New York as a Not-For-Profit Organization. In order to commemorate and celebrate the establishment of KHIF, Kyung Hee Family Night was held at the Seoul Plaza Banquet Hall in New York City with Dr. Chungwon Choue, the president of Kyung Hee University and Dr. Dong Han, the deputy of the Kyung Hee International Exchange Center. The Family Night was organized and conducted magnificently by Mr. Byung Tae Cho, the Chairman of the New York Alumni Association. 7 Members of Board of Directors of KHIF elected Mr. Byung Tae Cho as the Chairman of the Board from February 15, 2001 to February 28, 2001 by vote with mail ballot. The Charter Members Association of KHIF has been dissolved as of February 28, 2001 and the KHIF officially started on March 1, 2001 under the great leadership of Mr. Byung Tae Cho, the Chairman of the Board of Directors.